reclaimed by nature. The subdistrict of Peenemünde, measuring 25km², houses a variety of ground and building monuments from the 17th to the 20th century. The focal point is the ruins of the Peenemünde research facilities, which are now seen as one of the largest surface monuments in Germany. A large part of the area, however, is still contaminated by munitions and is not accessible to the public. 25km in length, currently with 20 stations. Leaving out the sensitive areas, visitors are guided to the most historically interesting points. At each station there is a board with further information. Starting at Peenemünde Historical Technical Museum, the individual circular route enables the visitor to experience the ecological and symbolic value of this landscape, as it makes visitors think about the relation between humans, nature and technology. The first station in the monument landscape of Peenemünde is the Bunkerwarte control room, which has been used since 2004 as the entrance area of the Historical Technical Museum. The building was constructed at the same time as the power plant. With walls up to 2 metres thick and ceilings made from reinforced concrete, the high bunker served as an air raid shelter for the power plant staff during the war, but it also housed the power plant’s control room. From here, most of the power plant processes were controlled remotely. However, in the 50s the Bunkerwarte lost its importance, as the control room was moved into the power plant building. At the end of 1939, the planning and construction of the power plant at the Peenemünde harbour was started by Siemens-Schuckert AG, with it being gradually put into service up until 1943. The power plant, fuelled by Silesian coal, was designed to provide 33 megawatts, which was supposed to be doubled by a second symmetrically added block. However, this block was never built. With its construction and design – with cubic shapes and the dark bricks on the façade – the power plant emulates the large power plant constructions of the 1920s, somewhat following the style of Werner Issel. This practicality coupled with monumentality, ultimately associated with the “new construction”, shaped the overall appearance of the military and industrial buildings in Peenemünde. The location of the power plant, directly on the Peenestrom strait, was chosen specifically; after the supply of construction materials, the previous construction of the harbour facility guaranteed in particular an efficient coal supply by conveyor track directly from the ships docked in the harbour. Another aspect made this location especially attractive as well, because the cold water could be taken directly from the Peenestrom strait and the hot water from the power plant could then be channelled back to the harbour edge. This kept the harbour entrance ice-free in the winter. At the time of construction, the facility was one of the most modern coal power plants in Germany. Many companies that are still renowned today were involved in the construction and fitting. Architecturally, the former power plant is still in good, restored condition and illustrates the characteristics of Nazi architecture, despite an extension from the GDR era. As well as its modernity in shape and function, and the key importance attached to the facility for the energy supply of the Peenemünde sites, its special role is highlighted by the fact that the power plant, its conveyor system and the Bunkerwarte control room, as well as the harbour facility, have been practically completely preserved as a whole complex. From May 1991 to December 2000, the exhibition by Peenemünde Historical Technical Information Centre was located in the Bunkerwarte. Today, the till area of the museum and museum shop are located here. 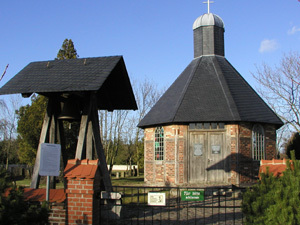 The original octagonal central structure of the Peenemünde cemetery chapel originates from 1876 and was built based on plans by Friedrich Kräger. 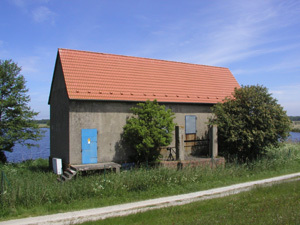 It is one of the few preserved buildings in the original fishing and farming village of Peenemünde, most of which was demolished with the construction of the Peenemünde research stations at the end of the 1930s. After the deterioration of the building during the GDR era, the evangelical church community began to restore the chapel in 1993. Today, it is an almost completely new construction on the foundations of the original building. The building may have therefore lost “monument value” in the sense of monument preservation, but it has gained important new value as a place of remembrance. The significance of this site is defined in particular by the mass grave, which was discovered on the southern side of the cemetery in the mid-60s. The dead bodies were those of prisoners from the Karlshagen I concentration and work camp who were buried here from December 1944 to March 1945. Former prisoners from the army research station and residents of the area gave crucial information about the different graves along the old cemetery wall. The ceremonial reburial of the dead after Karlshagen took place on 30 May 1968 on the site of today’s memorial. Apart from the power plant, the oxygen plant in Peenemünde is, today, the only large building from the former army research facility that has been almost completely preserved. The further extension of the army research facility, decided upon at the end of 1938, also included the mass production of rockets. However, this made the production of liquid oxygen – the second rocket fuel component for the A4 (“V2) rocket, as well as alcohol diluted with water, necessary on-site on an industrial scale. Around 4 tonnes of both components were needed for each rocket launch. The existing oxygen facility in the development plant was no longer enough for the amount of oxygen required. 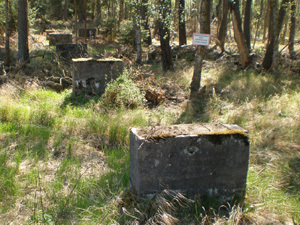 Therefore, from July 1942, a second oxygen plant was built on the site of Peenemünde – the village destroyed for that purpose. 13,000kg liquid oxygen was created each day, round-the-clock in three shifts. In a complicated physical process (Linde technique), air was broken down into its components and the oxygen cooled to -183°C and thus turned into liquid. This liquid oxygen was transported in insulated tank wagons to the test sites. The energy requirements for the oxygen plant were very high. Of the 30MW power output produced by the power plans, the oxygen plant alone consumed 22MW. Despite being damaged in air raids by the Allies in 1944, oxygen production continued without any major problems. 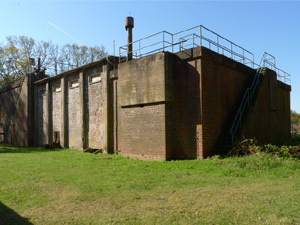 The oxygen plant is a witness of the specific architecture that is a feature of the second extension phase of the army research facility from 1939. The building measures 73.1 metres along the road, it is 42.6 metres deep and with a height of 20.8 metres it is just under 15 metres lower than the boiler house of the relatively nearby power plant building. Just like the power plant, the building is clinkered with dark red brick, and built with a ferroconcrete skeletal structure. These materials and architectural elements shape not only the large buildings in Peenemünde, but practically all buldings with various different technical functions. The requirement for the design of the individual buildings to form a superordinate uniformity can be seen in the design sketches of the “Baugruppe Schlempp” construction company. With the entire power plant complex and harbour facility, the oxygen plant is one of the main buildings in Peenemünde, in terms of both technology and design. After the war, the technical facility was demolished by order of the Soviet military administration and parts of it were used again in Bützow (in the administrative district of Güstrow) to create a new oxygen plant. The building in Peenemünde was severely damaged by demolition and explosion tests. During the construction work for the navy in the Peenemünde main harbour, storage space and the office of a construction company were sited, and they are still there today. The listed building has stood as a ruin in Peenemünde ever since. Different steps are currently being taken to secure this building and open it up to visitors in the future. The project is split into three phases. In the first phase, the whole area will be cleared of vegetation and refuse, and an inventory recorded. The next plan is to set the scene of the building better with light installation. In the last phase, the installation of outdoor stairs and more entrances will enable further insights for visitors. The Peenemünde West research station, run by the Luftwaffe, was parallel to the army research facility and also tested weapon systems, and sometimes rocket propulsion as well. The airfield in Peenemünde was part of the Luftwaffe research station and with its large runway it was one of the largest airfields in Germany during the Second World War. From 1938 to 1945, various different guided missiles, rocket-propelled aircraft and start-up rockets were tested. Some of the most famous missiles to be tested here were the Fi103 (“V1”), the He176 and the Me163. 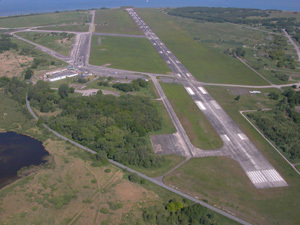 The airfield was situated on the so-called “Kaasewiese” meadow, which was only slightly above sea level and repeatedly flooded at high tide. Therefore, a dike was erected along the coast and the area behind it was rinsed out, section by section, with sand from the earth around Greifswald. The runway was laid on this surface, which was raised up to 2m at some points. In February 1945, Soviet concentration camp prisoner Michael Dewjatajew and nine other prisoners from the nearby Karlshagen I concentration and work camp escaped spectacularly over the front line to the Soviet Union in a German aircraft. After the war, the facilities at the research station were dismantled or destroyed in compliance with the Potsdam Agreement. The Soviet air force used the airfield in almost field condition until 1958. This year, the area was handed over to the National People’s Army, who stationed the Jagdfliegergeschwader 9 squadron here from 1961. The role of the squadron included monitoring the airspace from the Polish border to the west of Rügen. For this purpose, the runway and landing strip, facing a north-westerly direction, was extended by a total of 2,400 metres, so that it could be used by more modern aircraft. On 3 October 1990, the German air force took over the JG 9 squadron, which was then disbanded step-by-step. With the landing of a Cessna 207 on 23 July 1993, the airfield in Peenemünde began civil air traffic operations. In response to the constantly increasing shortage of workers, concentration camp prisoners were also used from spring 1943 at the Peenemünde research stations. Karlshagen I concentration and work camp existed from May 1943 to the beginning of April 1945, in close proximity to the eastern community camp. Pre-existing barrack buildings were used for this purpose, which were originally built for relatives of soldiers in the Wehrmacht. The camp consisted of five barrack blocks for prisoners, surrounded by a barbed wire fence. Several small bunkers for the guards and watchtowers secured the site. The camp also included a muster ground, a washhouse and the kitchens. A low storage building was located somewhat to the side. In this camp, which was controlled by the management of the concentration camp in Ravensbrück, 1,500 male prisoners of different nationalities were kept. The prisoners were mainly used at the Luftwaffe’s research station sites, where they had to carry out earthwork on the airfield, refuel aircraft and uncover dud bombs after air attacks for defusal, for example. During the testing of the Fi 103 (“V1”) flying bomb, the prisoners had to carry the 150kg warheads from the marshy reed belt to the launchpad (Walter-Schleuder). The exhausting manual labour, completely insufficient nutrition and often inhumane treatment caused many prisoners to die. The death of 248 prisoners from May 1943 to March 1945 is documented. In February 1945, concentration camp prisoner Michael Dewjatajew and nine other prisoners succeeded spectacularly in escaping from the nearby airfield, across the front line and into the Soviet Union in a German aircraft. The break-up of the Karlshagen I concentration and work camp had already started by the end of January. In the beginning of April 1945, around 200 prisoners were transported to the “Dora” concentration camp. The camp grounds were made accessible again during an international summer camp in 2006. Foundation remains of a barrack block and a bunker, amongst other features, were made visible again. The foundations of the barracks were not made of concrete, but wooden stakes. The stakes were rammed into a pit with the dimensions of the barracks, on which planks and boards were fixed to form the barrack floor. The barracks were then built over it. The remaining stakes can be seen in the pit today. Further monument maintenance measures will be carried out on this site in the future. One of the first construction projects of the Peenemünde research stations was the building of an industrial railway that was officially commissioned on 28 July 1937, and headed in the direction of the only two cities with S-Bahn lines: Berlin and Hamburg. 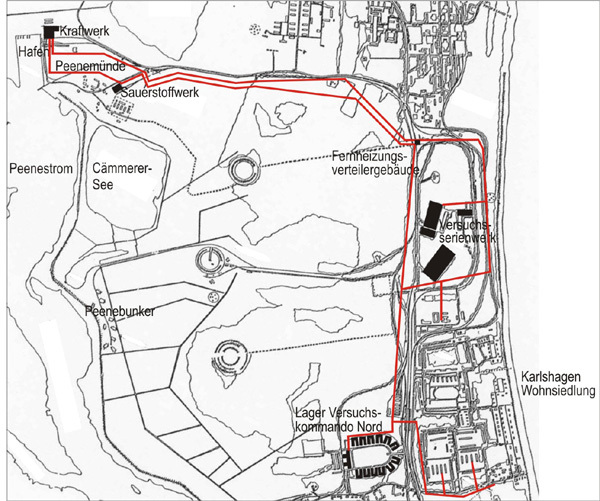 They initially ran between Zinnowitz, the west of the plant and the east of the plant (Werk West and Werk Ost). In the following years, the rail network was expanded repeatedly so that other parts of the factory facility could be reached by rail. In the largest development stage, the track network was 106km long. For passenger transport, steam engines with passenger cars were initially used, and later on battery electric multiple units. Electric train operation began on 15 April 1943. The Werk Ost stop was used by the employees of the development plant and residents of the accommodation on the other side of the road. 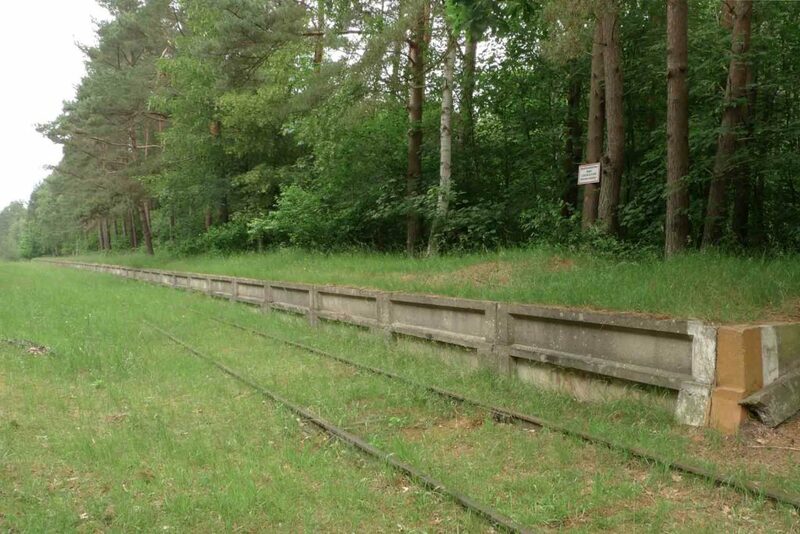 As it was close to the Karlshagen I concentration camp, prisoner transport also ended here. Today, this platform is the only easily accessible platform to be kept in its original condition on the former research site. 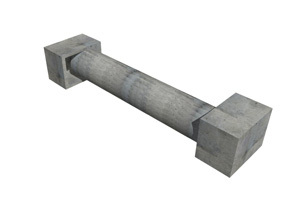 It consists of prefabricated concrete parts and is approximately 180m long. As the train doors and platform edges were at the same level, easy boarding and alighting was possible. Electric trains from the ET167 series were used – a modified design of the Berlin S-Bahn train with power brackets at the top. 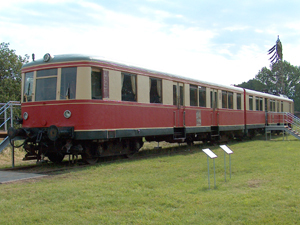 An original train from the industrial railway is now on display at the Historical Technical Museum. At the entrance to the army research site Peenemünde Ost and the Peenemünde West Luftwaffe testing station was the Hauptwache. It consisted of a sentry building with space for the guards and a mailroom. On the first floor of the building there was an apartment in which the manager of the messaging centre lived with his family. This complex also contained a garage area. The Hauptwache was a checkpoint for traffic. Because of the strict security regulations, the individual restricted areas could only be entered with the right authorisation. For this purpose, employees of the research site had special identification and badges of different shapes and sizes. These badges had to be worn visibly on clothing. In the course of the expansion of the research sites, the Hauptwache lost its importance, as each individual area began to have its own guardhouse. After the end of the war, dismantling squads cleared the Hauptwache down to what remains today. During international summer camps in July 2000 and August 2007, in cooperation with the “North German Youth in International Community Service” and the Peenemünde Historical Technical Information Centre, as it was called at the time, the foundations of the former Hauptwache and a part of the road were uncovered. Young people from Poland, France, Algeria, Russia, Japan, Switzerland, Serbia, Turkey and Germany made history visible again during these camps. Since 2013, this ground monument has been permanently maintained by pupils from the “Regionalgeschichte” (Regional History) work group from the Heinrich-Heine school in Karlshagen. The “Schülerpatenschaft für ein Bodendenkmal” (School Sponsorship for a Ground Memorial) is a collaboration between the school and Peenemünde Historical Technical Museum. Further measures are planned over the next few years for the Hauptwache. With the commissioning of the coal power plant, large areas of the Peenemünde research facilities were supplied with heating as well as electricity. The large workshop buildings in the research line factory, the camp barracks of the “Versuchskommando” squad in Nord Karlshagen and several buildings in the residential area, for example, were heated. Across an extensively branched system with district heating pipes, some of which were above ground and some underground, buildings were supplied with hot steam at 132°C. From the power plant, two lines ran parallel to the S-Bahn track up to a distributor housing. From there, the power network branched out into the individual supply sections. After the Second World War the district heating network was dismantled by the Soviet occupation force. The power plant in Peenemünde then only supplied electricity until 1990. Today, the power plant, the largest industrial monument in Mecklenburg-Vorpommern, houses Peenemünde Historical Technical Museum. For the so-called test series plant in Peenemünde, a material storage hall with floor space measuring 180m x 95m and a height of 18m was originally supposed to be built. It was designed by the Baugruppe Schlempp construction company, but because of a material shortage it was never fully implemented. Only the base plate and the rail connection were built. The giant hall was intended to store materials needed for the mass production of A4 rockets. 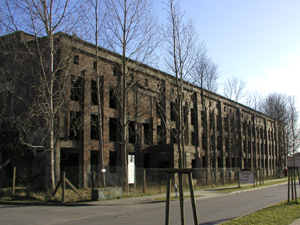 After the first air raid on Peenemünde in August 1943 and the subsequent shift of series production to the underground production base in Mittelbau-Dora near Nordhausen, further development of the material storage hall was halted. 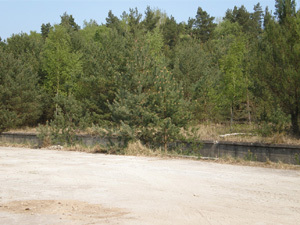 However, the facility was used in its unfinished condition as a building yard from which the construction sites in the Peenemünde research stations were supplied with the necessary construction materials. Today, the base plate of the building is still well-recognisable on the site, as well as the hall’s rail connection, the loading ramp and the staircase. The test series plant contained a variety of other buildings. It was used to gather findings in the series production of the A4 (“V2”) rockets. These findings were supposed to be used later on in large industrial mass production that was planned outside of Peenemünde at other plants in Germany and Austria. 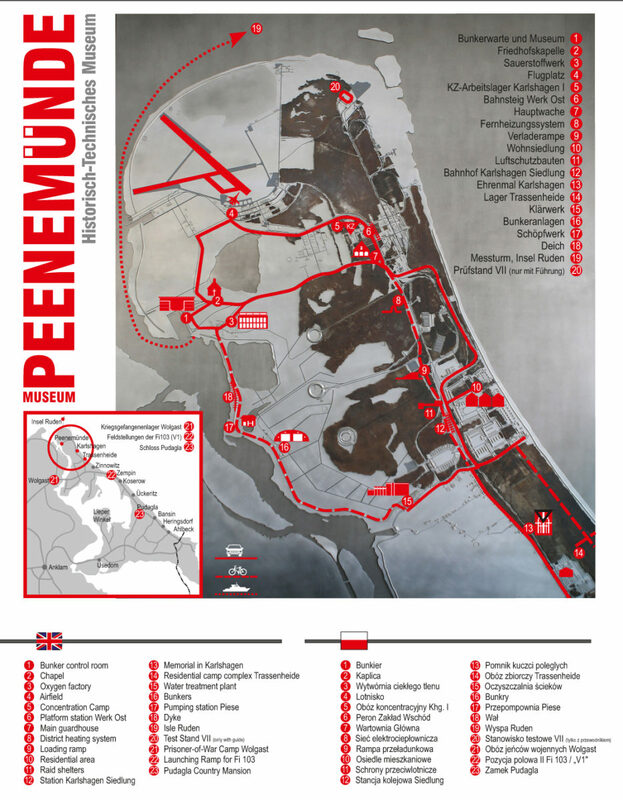 The original plan presented in October 1939 by the Dywidag company for Peenemünde included no fewer than three production halls with vast dimensions as well as a large repair workshop and three large acceptance testing stations. At the army research facility, the series test plant represents the most structurally monumental area. The production halls, of which only one was built in the end, were supposed to be state of the art. Therefore, people were already looking in September 1939 at the construction project for the Volkswagen factory and selected a similar construction with a modern shed roof structure for the F1 production hall in Peenemünde. The construction was carried out by Dywidag, which had already carried out the building of the Volkswagen factory in Wolfsburg and had worked for the “Waffenamt”, the army’s weapons agency, in Kummersdorf, for example. The F1 hall was completed in May 1943, and on 17 June 1943 the first concentration camp prisoners reached the location. They were kept on the base level of the hall. In July 1943, the series production of the A4 rockets was started, with the use of said prisoners, until the air raid on 17/18 August 1943 initially put a stop to the work. The F1 production hall in particular was where the results of the A4 rocket development were put together. After the first rockets were produced almost manually, the basis was formed for series production and all the requirements for other plants and production, e.g. in Mittelbau-Dora, were satisfied. With the construction of the Peenemünde Ost army research facility and the Peenemünde West Luftwaffe test site, there was a need to create corresponding living quarters for the permanent staff. In 1936 the construction of a modern residential area for 400 workers and employees began. The first homes were moved into in summer 1937. A settlement with the corresponding infrastructure such as a store, school and restaurants was established. In 1938/39, the plans began for an expansion of the settlement, as the need for personnel was continuing to rise. The former beach colony of Karlshagen was included in this settlement expansion. By the time of the British air raid in August 1943, around 2,500 homes for around 5,000 inhabitants had been built in the residential area. Three quarters of the houses were destroyed in the air raid. However, one street remained widely intact and demonstrates the shapes and structures of the mostly vanished settlement. From the destroyed parts of the settlement, some of the structures of the gardens in today’s forest area can still be recognised. Already during the construction of the Peenemünde research stations from 1936, the danger from the air in a future war was recognised, but before the war air protection only played a minor role. Until 1943, there were four air-raid shelters at the eastern plant, but these were only for people who worked and lived in the plant. At the western plant, there were only eight air-raid shelters for all personnel. In addition, simple air-raid shelters were made at many different points consisting of concrete pipes with no steel reinforcement. Due to the high groundwater level, these splinter protection buildings could not be placed underground. The pipes had a length of up to 10m and a diameter of around 1.5m. The walls were 30cm in thickness. Inside, the air-raid shelter was fitted with a continuous wooden bench. These pipes had right-angled entrances with no doors on one or both sides and were covered with a dark layer of earth. 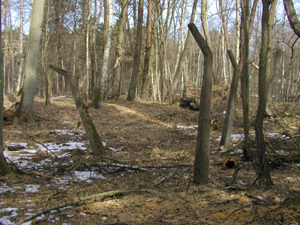 On the site of the Karlshagen work camp (later on the “Versuchs-Kommando Nord” camp) alone, 37 small splinter protection bunkers can be documented. The road and rail network was crucial for the movement of persons and goods within the army research facility. With the introduction of a rapid transit railway as an industrial rail network, the overall structure of which headed towards Berlin and Hamburg, the only cities with S-Bahn networks, the army research facility in Peenemünde clearly stood out from other industrial sites at the time. So that thousands of people could be transported each day from their homes to the workplace within the work sequences and shift changes, a rail network with a length of 106km and connections to many parts of the army research facility was constructed. The Karlshagen settlement station was the largest train station for passenger transport on the Peenemünde industrial railway. It had three platforms that were partially covered. 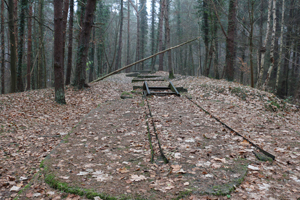 These platforms could be reached via an underground pedestrian underpass from the settlement or the Karlshagen camp (Versuchs-Kommando Nord). The unpreserved wooden train station building was on the edge of the residential area. For the employees of the Peenemünde research stations and their families, travel was free. At Peenemünde Historical Technical Museum you will find further information about the industrial railway in an exhibition that is located in a former Peenemünde S-Bahn train. 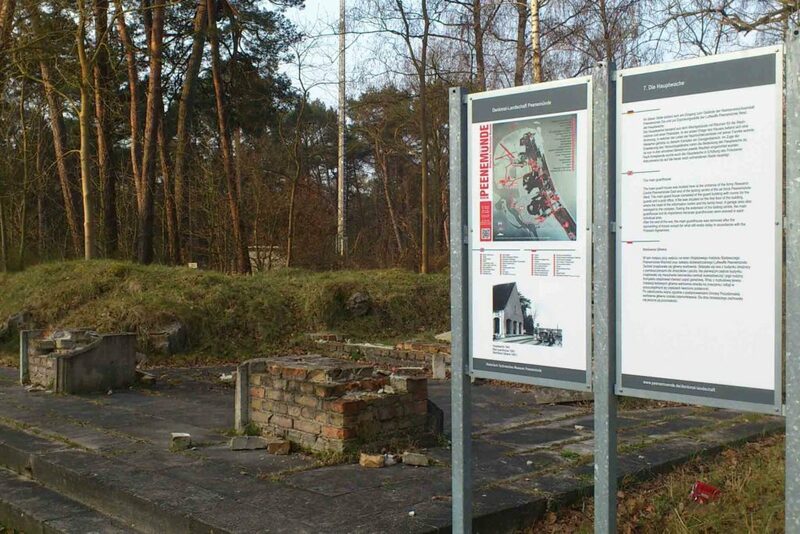 On the southern side of the cemetery in Peenemünde, a mass grave with 56 bodies was discovered in the mid-60s. They were prisoners from the Karlshagen I concentration and work camp. The ceremonial reburial of the bodies in the Karlshagen cemetery took place on 30 May 1968. 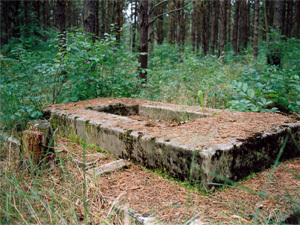 As well as the grave, the memorial for the forced labourers and victims of National Socialism was placed in the Peenemünde research facilities. 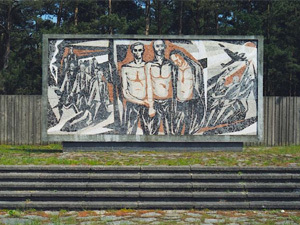 Painter Klaus Rößler created the memorial in the shape of the three-part mosaic which represents the suffering, solidarity and resistance of the concentration camp prisoners at the Peenemünde research stations. 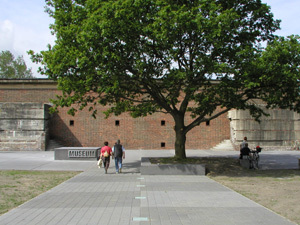 The opening of the memorial took place on 8 May 1970 as the “Peenemünde – Karlshagen Place of Commemoration and Remembrance”. During the GDR era, the memorial was widely used for political work. In 1994/95, the memorial was redesigned. 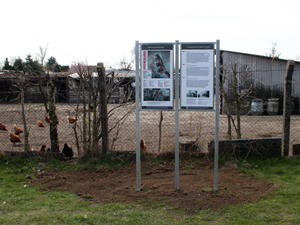 The space in front of the memorial was made smaller and on the right-hand side a board was introduced that reminds visitors of the victims of the Second World War in Karlshagen and Trassenheide. Those from the Karlshagen settlement who died after first air raid on Peenemünde in August 1943 were buried in the Karlshagen cemetery. By the end of the 1950s, this part of the cemetery had been abandoned and many of the original wooden crosses placed on the graves in the period after the war disappeared. The current state of the graveyard with small, dark stone slabs and the large memorial stones came about in the years after. The Trassenheide community camp was originally built in 1941 as accommodation for the specialist workers of the test series plant. However, it was then used to lodge workers who were used by various different construction companies to build the Peenemünde research stations. These workers also included drafted German workers, foreign workers from Italy, the Netherlands and the Czech Republic, as well as forced workers from Eastern Europe (Poland and Ukraine). The facility was continuously extended in three phases, as the countless construction measures in the army research facility and the neighbouring residential area made a constantly increasing workforce necessary. After the last expansion, the camp consisted of 40 accommodation blocks and 18 functional buildings (canteen, bordello block etc.) for around 4,000 workers. The residents were split according to nationality and the accommodation and living conditions within the camp differed strongly, as well as the survival chances of the individual groups of workers. Today, the camp has only been preserved very fragmentarily, as it was bombarded by mistake by the Royal Air Force in the night of 17 and 18 August 1943, an event during which around 300 people were killed. The camp was closed after the air raid. Like all infrastructure facilities of the Peenemünde research stations, the supply of drinking water and channelling of contaminated water was planned meticulously. When building the entire facility, wastewater disposal was ensured from the very beginning via a dense sewer system and efficient local facilities to gather and treat wastewater. The water and treatment works are still well-recognisable in their shape and operating sequences today, albeit mostly in ruins. To this day, the treatment plant in Karlshagen provides an example of this system, as it has been kept fully functioning and still serves as a reserve and emergency tank today. It was built to treat wastewater from the residential area and the surrounding facilities. 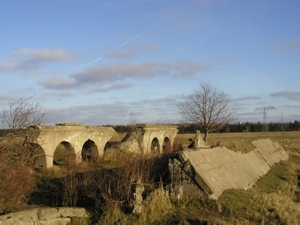 With the construction of the army research facility and the planned mass production of the A4 (“V2”) rockets, suitable and safe storage facilities in Peenemünde were needed. 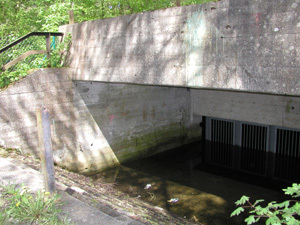 Of an original twelve planned above-ground rocket storage bunkers, however, only nine were constructed in Peenemünde. The buildings were partially put together using concrete prefabricated parts, and concrete segments in the middle of the structures served as supports for the shell-like roof construction. Each bunker had two chambers for the rockets stored on iron train carriages. These storage bunkers, however, do not just have a functional relationship with the series test sites and the production facilities in the Peenemünde test series plant, but also rocket production in Mittelbau-Dora. The original plan was to only store the rockets, made and tested in Peenemünde, in the bunkers temporarily until they were transferred to an arsenal. However, as the Peenemünde test series plant never produced to the extent planned, the bunkers were also used for the short-term storage of rockets from the “Mittelwerk” factory, which were taken to Peenemünde for quality testing – and probably also to protect them against sabotage. In 1944, two of the bunkers were also used for a short period of time for rocket storage tests, whereby the effects of more long-term storage on the functionality of the rockets were the focus of the experiments. However, the tests had to be interrupted after a few weeks, as the bunkers were needed for other storage purposes. 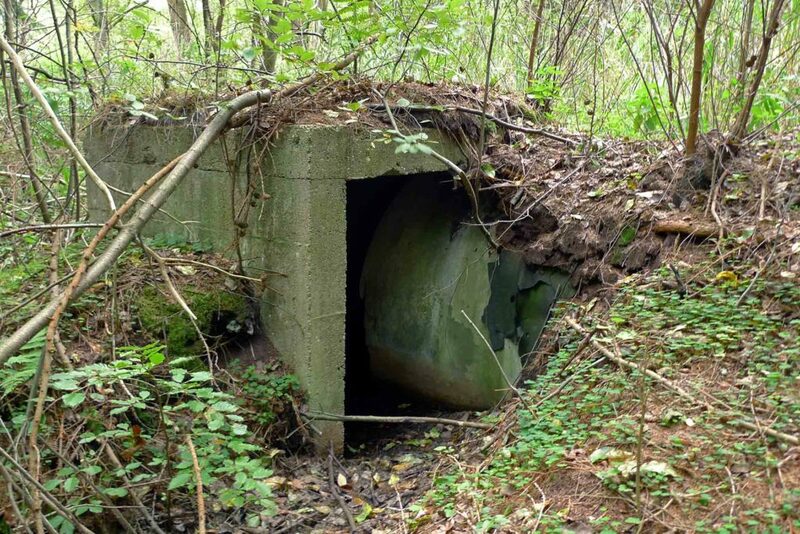 After the war, the bunkers were demolished in compliance with the Potsdam Agreement. The site was made accessible again during international summer camps between 2009 and 2011. The northern part of the island of Usedom, the so-called Peenemünde Hook, consisted mostly of wet meadows and marshland before 1936. A system of dikes, irrigation ditches and pumping houses and the reclamation of large parts of the area initially made it possible for the facilities of the entire Peenemünde research station complex to be built. A reduction of the groundwater level in particular was necessary. At the end of the 1930s, the regime’s labour service and specialist companies, who mainly used foreign workers, drained the areas. In the Piese, a lake, the water from the irrigation ditches was collected and then pumped continuously into the Peene using a pumping station that was extremely modern for its time. Planned from September 1939, it was commissioned on 10 July 1942. It was one of a total of three pumping stations on the dike and still carried out its duties today. Peenemünde and the entire Peenemünde Hook suffered repeatedly from devastating storm surges, as parts of the area were 1m below Normalnull (standard zero). Therefore, from the harbour in Karlshagen to the northern peak of the island of Usedom, a dike was made as part of the construction of the Peenemünde research stations from 1939. This dike was around 4km long, up to 4m in height and at the top it was around 3m in width. During the dike construction, the “Cämmerer See” lake was separated from the Peene. In order to provide further protection for the airfield and the location of Peenemünde against high tides, the sand on the planned construction area and airfield site was taken from the Peene and the Boden and the terrain level elevated by around 2m. 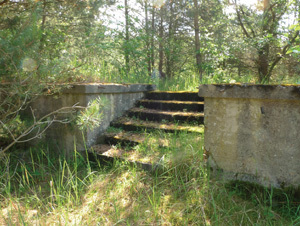 The dike was one of the few parts of the army research facility that is still preserved in its original sense and continues to carry out its original function. 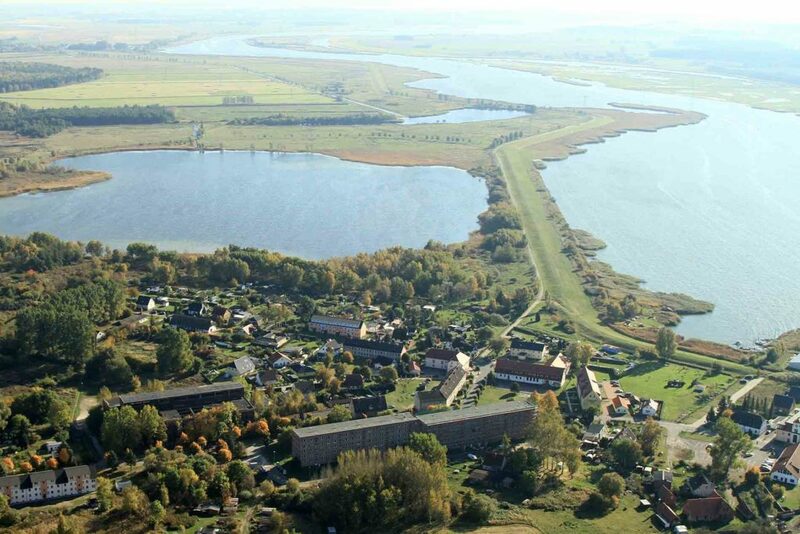 The small island of Ruden in the Peene river estuary was mainly used by the Peenemünde-West Luftwaffe research base as a basis for measurement. 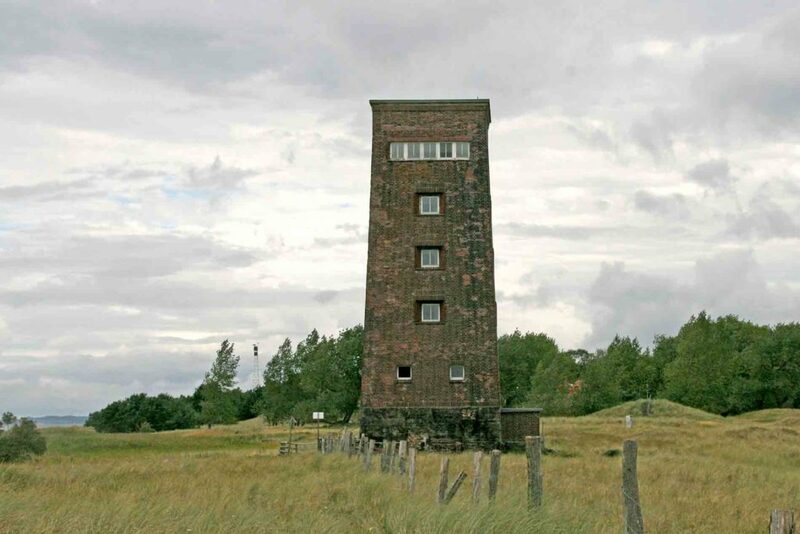 For this purpose, a wooden tower 30m in height was initially built, which served to monitor and measure the flying objects coming from Peenemünde. In 1943, a five-storey tower made from ferroconcrete was built at the same spot with a clinker shade façade, which is still there today. On the viewing platform, cinetheodolites were installed to film the trajectory and thus provide important values for the flight path calculations. From 1943, the island was developed to form a fixed air defence post, because it was directly in the preferred approach path of Allied bombers and was therefore of tactical importance. After the war and after the withdrawal of the Soviet occupying troops, a barrack complex for border patrol units of the NPA naval forces was built on the island. Ruden is located in the “Naturschutzgebiet Peenemünder Haken, Struck und Ruden” nature reserve and can be reached by ferry from the main harbour in Peenemünde. 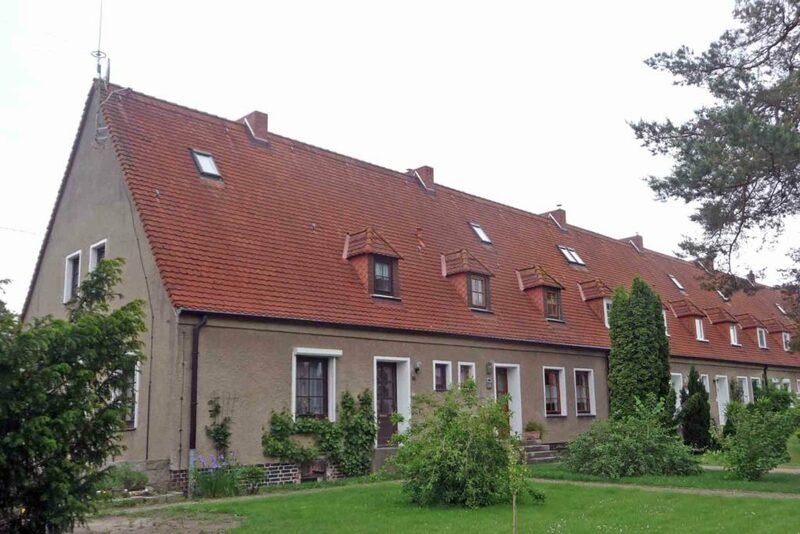 In Wolgast, from January 1943 to September 1944 the “Arbeitslager 2-С, Arbeitskommando Wolgast” work camp was located on what is now the Karriner Strasse. The camp for around 300 to 400 prisoners of war was controlled by the main STALAG II/C camp in Greifswald. It measured around 150m x 200m and was surrounded by a double barbed wire fence with two watchtowers. As well as the living quarters and a medical station, the camp also contained a carpentry and locksmith’s workshop, an art room, a graphite workshop and an electronic workshop. This camp housed mainly Soviet prisoners of war who made technical drawings for the army research facility in Peenemünde on the island of Usedom. Graphite and steel rods were also made here for the A4/”V2” rockets being developed. The Fi 103 was the first cruise missile to ever be used – an unmanned aircraft to transport almost one tonne of explosives. In July 1943, the 155 (W) Flak Regiment was stationed in Zempin to prepare for its wartime deployment. From three positions in the coastal forest, the flying bombs and launchpads were tested by soldiers under operating conditions and the operating teams were trained. Each position consisted of a launchpad, a main hall and some outbuildings. There are still traces of the Feldstellung II site today on the cycle path between Zinnowitz and Zempin, for which a 6m-high artificial hill was raised and an incision dug in the dune in front. The Fi 103 was launched from here, parallel to the Pomeranian cost in the direction of the bay in Danzig, and the trajectory measured from observation posts along the coast. From June 1944, the Fi 103, now called “Vergeltungswaffe (Vengeance Weapon) 1” for Nazi propaganda, was used against cities in Western Europe. Mass production was carried out by forced labourers and concentration camp prisoners, amongst others, in the VW factories in Wolfsburg and in underground tunnels near Nordhausen in Harz. Altogether, around 22,000 Fi 103 rockets were used in the Second World War. A replica of an Fi 103 and an original launchpad (Walter-Schlitzrohr-Schleuder) can be seen at Peenemünde Historical Technical Museum. At Peenemünde, Helmut Hoelzer developed the first autonomous on-board computer to guide a missile, the so-called “Mischgerät”, and also an electronic analogue computer to simulate trajectories. After the bombing of Peenemünde by the Royal Air Force in August 1943, Hoelzer’s department was relocated under the camouflage name “Karlshagen III” to Pudagla Castle. 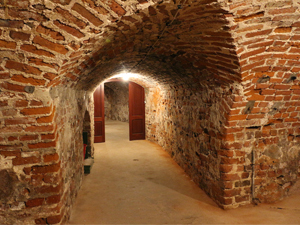 The analogue computer was located in the castle’s cellar until the beginning of 1945. Hoelzer himself was quartered in the Neu Pudagla forester’s lodge. The analogue computer was taken to the USA in 1946, and Hoelzer also settled in the USA after the end of the war and supported Wernher von Braun’s rocket research in Fort Bliss and White Sands. In 1960 he became Director of Computing at Marshall Space Flight Center in Huntsville, Alabama.